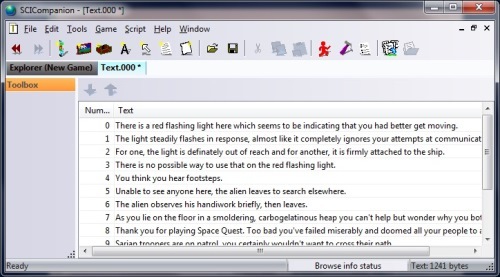 The text editor shows a list of all the text resources. It's operation is very basic. To add a new piece of text, click on the Click to add new text message at the bottom of the list, and type in the text. To delete text, click on the number to the left of the entry, and press DELETE. To move an entry with respect to the others, click on the number to the left of the text, and then click on the Move up or Move down buttons.